In returning to Dalmatia for the first time in many years, I attended the Dalmacija Wine Expo 2015 in Split and conducted a Master Class comparing three wines of Catalonia with three of Dalmatia. I know both regions well having written three books about Catalonia and one about Dalmatia and I mention that as at first glance the two regions wouldn’t make for apt comparisons at all for one unfamiliar. First off, the top of Dalmatia sits at the same latitude as Provence and the bottom of it just touches the northern border of Catalonia so one might think that comparing Dalmatian wines to those of Southern France might be a more reasonable proposition, except that it wouldn’t. I feel that the main reason for this is that while the weather is relatively similar, what differs a great deal are the grapes (there are a lot of “cooler” grapes in France apart from Grenache) and the winemaking style. Both in Catalonia and in Dalmatia fermentation with the stems is not nearly as prevalent. Why? Because they harvest at similar times whereas the French generally harvest a lot earlier in the claim that it allows more elegance to the wines which then need to have their tannins amped up by vine wood. Also, no one blends grapes to the extent of the French and so both in Catalonia and Dalmatia you see a lot more single varietal or nearly single in the wines. But beyond this, there’s the fact that Catalonia and Dalmatia have had a similar recent history with the last 20-30 years being a period of massive modernization and winemaking improvement. And with both regions there has been a trial period of using a bit of French grapes and now a return to those that are native which again returns back to the desire to make varietal wines rather than blends to show how tasty these native grapes can be. First up were the Fredi Torres – Classic 2013 from DOQ Priorat and the Bibich – Riserva R6 2012 from Northern/Central Dalmatia. These two paired very well due in a large part to the two winemakers being of a similar feather. I’ve never not enjoyed myself when in the company of Fredi or Alen and this comes through a lot in their wines. Both of these were blends, but they were blends of fully local grapes (with the exception of a dab of Syrah in Fredi’s wine). They had a similar ageing regimen and they’re both created to be youthful, of-the-moment wines that hold a good deal of complexity nonetheless. It also helps that the vineyards for these wines are a bit inland from the coast and this is what gave them both a good degree of nuance due to the fluctuation of temperatures between day and night. Had this been a 2012 vintage from Fredi, they probably wouldn’t have paired as well though as that was year of big wines and it would have huffed and puffed at Alen’s wine with a great deal of overwrought derision. But Master of Wine, Jo Ahearne who attended the tasting also stated that they were definitely the most comparable of the wines. 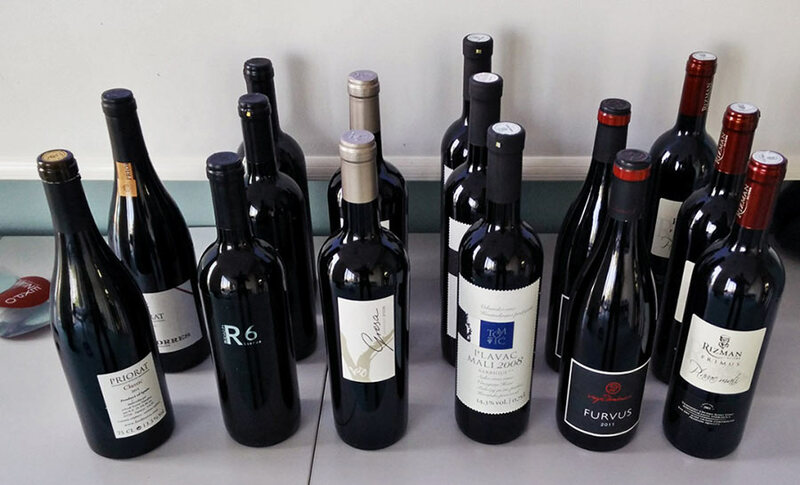 Next were Vinyes d’Olivardots – Gresa Expressió 2008 from DO Empordà and the Tomić – Plavac Mali Barrique 2008 from the island of Hvar. Simply put, these were not a good pairing. You could say it was due to different climates (sea vs. inland foothills) or style (a mostly Grenache/Carignan blend in the Expressió vs. 100% Plavac in the Tomić.) But overall I’d have to say it’s just due to the Expressió being one hell of a wine. Even seven years on, it was still full of primary fruit and very much alive. The Tomić was barely eking out any secondary fruit and was at the end of its life. The reason for this misalignment was that I thought I was originally going to be getting a wine more from the coast on sandy soils, but instead ended up with the Olivardots, not that I’m complaining as it showed those in attendance what Catalonia is capable of. It’s just that the Dalmatian wine should have been a good deal different as I’ve been finding in recent vintages the heat of coastal and island vineyards are having trouble gaining that much depth in the final wines in Dalmatia. I partially blame global warming, but it also has to do with some of the winemakers, now having fully modernized, still needing to find the perfect path for their wines. Last were Vinyes Domènech – Furvus 2011 from DO Montsant and the Rizman – Primus 2011 from Komarna in Southern Dalmatia. Like the first pairing, these two were quite harmonious with one another. There was more agreement in soil types with these two as well as the years and ageing being very similar. Also, the Furvus is a more straightforward blend with 80% Grenache and worked well with the 100% Plavac Mali from Rizman. But more than anything, I found that the climates played more in to this. The vineyards of Domènech are inland with a light sea influence which is very similar to Rizman’s in Komarna. This allowed a similar level of depth to the wines as well as the fact these two are make in similar styles for upper-midrange market of wines. Overall, it was a very interesting exercise. I just wish I had tasted the Dalmatian wines previously as I might have chosen one or two differently, but it was still a strong showing and as always, I’m very much in favor of more of these comparative tastings as wine regions understanding what others are doing is quite key to furthering good winemaking around the world.